Few well known Ganesha temples in Bengaluru are listed below. If you are aware of any which needs to be listed here, please let us know. The wealthiest & politically the most sought after Ganesha in Bangalore. This is the only temple that has a diamond armour and diamond kirita (headgear), which can be seen on the festival day. Address: Opposite Jain Temple, Jayanagar IV Block, Bangalore. The temple started in 1979 attracts a lot of software professionals from HSR Layout, Airport Road, Sarjapur and Koramangala. Housed on the boulder hill were the bull temple sits on the boundaries of Bugle Rock garden, this Ganesha has the distinction of being the biggest in Bangalore. A monolith of proportions 18 feet high and 16 feet wide, and by far the most visited. History says Bangalore’s founder Kempegowda chanced on one among a heap of large boulders that had on it impressions that looked like the figure of Ganesha. He ordered his sculptors to carve an idol from this. Dodda Ganesha also goes by Satya Ganapathi and Shakthi Ganapathi. 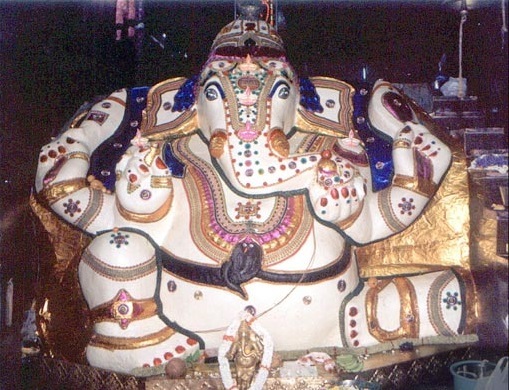 The idol is covered in cream paint with golden lace and buttons on it. The butter coat decoration involves around 100 kg butter smeared on the idol is the most popular one. This is situated in Hanumanthnagar area. It is the seat of the five-faced Panchamukhi Ganesha, one of the 32 avatars, known as the shakti avatar whose vehicle is the lion. It is situated inside a Shiva temple. It has five steps of ten-inch lamps around Ganesha temple’s core garbhagudi and electricity is switched off during the celebrations. This is about 600 years old. The rock had a face naturally looking like Ganesha. This was where Bangalore’s founder Kempegowda came and paid obeisance before hunting. During the 1950s and 1960s it became the most trusted God of Chamaraja Wodeyar, who would bring all new cars gifted to him by his western friends for his south-after lectures. Circus companies have known to have sent their elephants and camels so they would behave and not run away. Today people prefer to visit this temple after buying their new car or two-wheeler. Monday, Wednesday and Friday are very busy days at this temple.